Ok, so let's be honest here, Benefit Cosmetics is not a brand that many people associate with having a solid collection of foundations/face makeup. Although I am a BIG lover of the play sticks, they don't quite have the cult following as many other brands have managed to get for their own products - even though they may deserve it! So in light of that, Benefit have brought out their 'bigger than BB' foundation, The Big Easy. Unlike most bb creams, The Big Easy actually dries to quite a matte finish. Personally I really like this factor, as someone with combination/oily skin, its unusual to find a base that promises the skincare benefits of traditional bb creams, yet still delivers a wearable finish - I normally have to powder a fair amount over bb creams I have used in the past to ensure I don't get too shiny throughout the day. 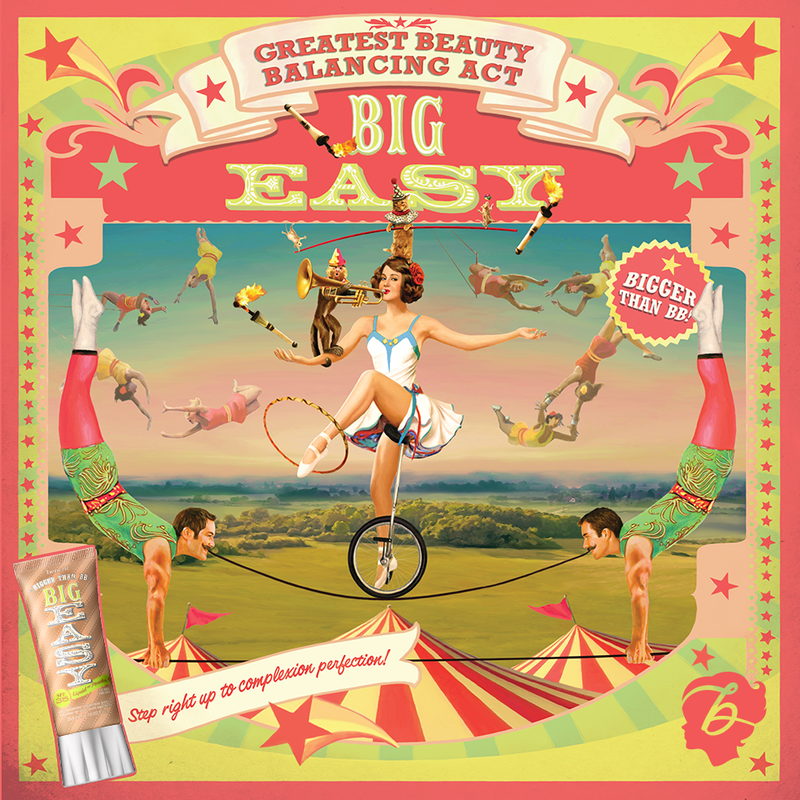 In true Benefit style, The Big Easy packaging and power visuals are very 'out-there'. A playful take on the #BalancingAct that many women undertake on a daily basis to juggle anything and everything from careers, families, social lives and all the while looking flawless! I've tried The Big Easy a fair few times now and I have to say, that it has fast become my favourite out of all the bb creams that I have tried. I do recommend - as I would with any foundation - going to your local store that stocks the product to ensure you get the right shade for you. While The Big Easy claims to match your skin tone, it is always a good idea to see which out of the 6 shades works best for you. I'm definitely going to be reading about what other bloggers think about this product, I really think it is different to many things on the market at the moment. If you're reading this and you've written a review, or have tried it and have any comments - please let me know! I'd love to hear from you!